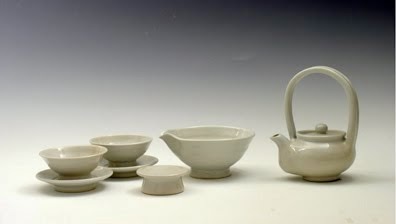 Park Jong I'ls ch'at gi or tea sets like all of his work are very Korean. Usually simple, always functional. They are both elegant and earthy. 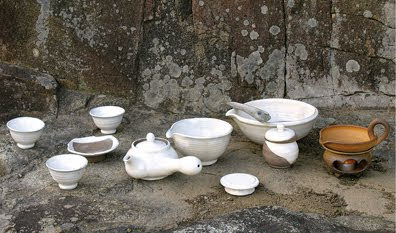 This tea set above includes from the left tea cups ch'at chan a small serving dish, tea pot ch'akwan or ch'at chonja with side typical Korean side handle a cooling bowl mulchikim sabal or kwityaekurut stand for tea pot lid, water discard bowl kaesukurut on which a ceramic tea scoop ch'asi sits with tea caddy ch'aho. The tea caddy is not used for storage but for serving or ceremony. Tea scoops are most often made of bamboo. Finally a small heater and pouring bowl. 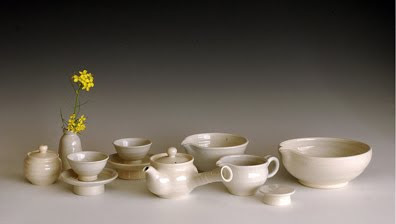 This porcelain set includes-from the left- a tea caddy, a small flower vase, two cups with stands, a tea pot with the typical Korean side handle, a cooling bowl (behind), a water pitcher for transferring water, a stand for the tea pot lid and a water discard bowl. I'm sorry that I don't yet know all the terms in Korean. This tea set grouping is less elaborate but includes a small tall handled tea pot, cooling bowl (that is particularly important for green tea), a stand for the teapot lid and two cups with stands. Most Korean tea pots for infusing tea are small and are used for multiple infusings during the sitting. 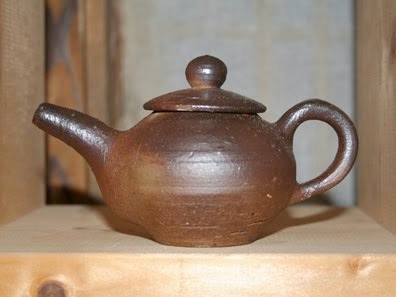 You have seen other examples of Park Jong Il's tea pots in earlier postings. 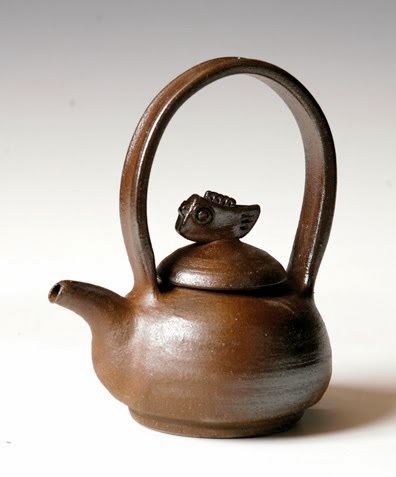 This moderately sized tea pot ch'akwan or ch'at chonja is a classic Jong Il. Simple in form, the spout is perfectly placed with the opening at water level. The tall arching handle was formed as a ring on the wheel cut and placed on the vessel. A whimsical figure sits as the handle for the lid. This teapot is unglazed with subtle wood ash flashing and back handle. 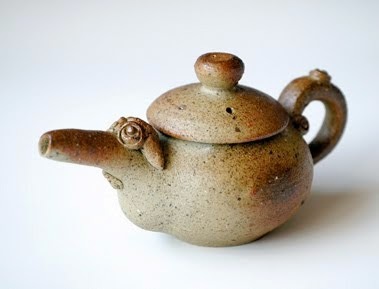 A little whimsy doesn't hurt this small teapot with wood ash flashing. Park Jong I'ls work, for the most part, is not flashy but simple, natural and functional work. They are made to serve. 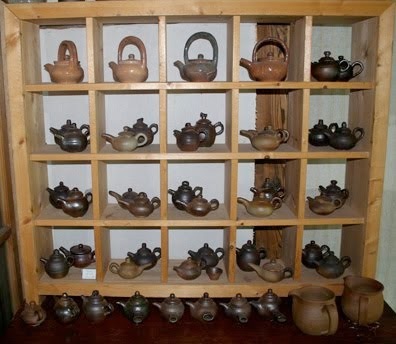 I really enjoy seeing Park Jong Il's tea pots and pouring vessels and am impessed by their subtle variety when viewed as a group. As stated earlier, Park Jong Il's work is related to his life, simple, direct, honest and natural - humble and un-adulterated. Perhaps there are some who will find Jong Il's work too plain or boring. But each piece is born from a natural approach to living and is created effortlessly as he peacefully sits at his wheel. In Seon (Zen) there is a saying that at the end of the road lies effortless peace. What more can be desired?